Sky News - Australia and New Zealand’s leading multi-platform 24-hour news supplier - has recently ordered their 7th LiveU LU60-HD Cellular Video Backpack from OnAir Solutions’ the local partner of LiveU. A key element in the success of LiveU for Sky News is the built-in, proprietary antenna solution in the LiveU LU60. The antenna array leverages highly advanced RF technology for exceptionally resilient transmission, beyond the capabilities of off-the-shelf modems. With the recent integration of the Telstra 4G Modems, poor coverage areas that are considered “no-go” zones can be transformed into HD transmission opportunities for news gatherers. 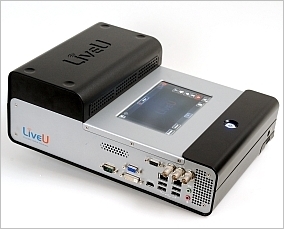 LiveU’s LU60 has an abundantly rich feature set for Mobile ENG over multiple wireless networks. The LU60 bonds up to 14 cellular (3G/4G), WiMAX and Wi-Fi modems to provide a resilient, broadcast-quality video uplink, packing the capabilities of an HD Satellite truck into a compact backpack. The LU60 adds features such as 1080i HD video resolution and super performance even at ultra-low sub-second latency.